[S677] Index - England High Court of Justice, England & Wales National Probate Calendar, proved at the Principal Registry by oaths of Robert FORSAITH of 5 Albion Rd East, Stoke Newington, gentleman, Ralph NEEDHAM of 105 High St, Shoreditch in the said County, linen draper and John Smyth MITCHELL of 60 High St aforesaid Leather seller, the son, the Executors. [S677] Index - England High Court of Justice, England & Wales National Probate Calendar, proved at Ipswich by the oaths of Robert FORSAITH of 9 Lordship-terrace Stoke Newington in the County of Middlesex Gentleman the Nephew and John STOKES of Bocking aforesaid Watch-Maker the Executors. [S166] J W Forsaith, "Forsaith Family tree 1715-1942" ,this source gives a death date of the 22nd, not the 23rd. [S190] Index - GRO and Office of National Statistics, England & Wales Civil Registration Qtrly Indexes, Death: District of Pancras, Vol 1b, p30. [S6] Newspaper - Times of London, edition of 25 May 1883, p.1, col A. [S677] Index - England High Court of Justice, England & Wales National Probate Calendar, proved at the Principal Registry 14 Jun 1883 by Alfred Wilberforce HALLof 47 Downs Park Road Hackney in the said County Bootmaker, one of the Executors, then proved at the Principal Registry 30 July 1890 by Edith Madeline FORSAITH of 3 Lordship Terrace spinster the Daughter and the other Executor. Former Grant Principal Registry June 1883. [S677] Index - England High Court of Justice, England & Wales National Probate Calendar, proved at the Principal Registry 30 July by Edith Madeline FORSAITH of 3 Lordship Terrace spinster the Daughter the other Executor. Former Grant Principal Registry June 1883. 126. 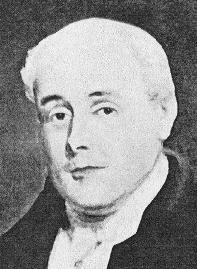 Robert Forsaith of Braintree Born August 13 1781 Baptized Septr 19 1781. [S353] Electronic Files - Pallot's Marriage Index, by Institute of Heraldic and Genealogical Studies, cited as being 'w.' (widow). [S581] London Metropolitan Archives, at http://www.ancestry.co.uk, Saint Mary, Hornsey, Register of marriages, DRO/020/A/01, Item 007. [S494] Reference - Library - London Guildhall, Bunhill Fields records for Section 10, plot 111. [S390] Book - S Forsaith, Samuel Forsaith Commonplace book, see entry 225-228. Robert died on 27 June 1797 in Sleaford, Lincolnshire.1 He was buried on 29 June 1797 in Sleaford. [S670] Newspaper - Protestant Dissenter's Magazine, 1797, p280. [S347] Will - Elizabeth Willoughby, UK PRO. [S531] Will - Robert Forsaith. [S190] Index - GRO and Office of National Statistics, England & Wales Civil Registration Qtrly Indexes, Birth: District of Royston, Vol 6, p625, 2Q1851, mother's maiden name BENDALL. [S116] Census - 3 Apr 1881, UK Census, ED 26 RG11-0597 Folio 27 p5 FHL film 1341136. [S118] Census - 30 Mar 1851, UK census, ED 10a HO107-1707 Folio 434 p31 GSU roll 193615. [S367] Census - 2 Apr 1871, UK census, ED 5 RG10-877 Folio 52 p65 GSU roll 823476. 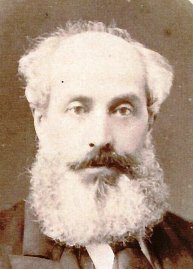 [S443] CD - NZ Marriages, CD - NZ Marriages 1836-1956 V2, NZ Registrar General's Folio 3548. [S542] Index - New Zealand BDMs online, at http://www.bdmhistoricalrecords.dia.govt.nz/, Marriage Reg. No. 1889/3471. [S284] Index - New South Wales BDMs online, at http://www.bdm.nsw.gov.au, Death Reg. No. 14746/1919 daughter of William J and Mary. [S284] Index - New South Wales BDMs online, at http://www.bdm.nsw.gov.au, Marriage Reg. No. 14164/1922, under name of ALLEN. [S928] BDM NSW Registry, marriage record, Reg. No. 14164/1922, under names of FORSAITH and ALLEN. [S284] Index - New South Wales BDMs online, at http://www.bdm.nsw.gov.au, Death Reg. No. 18111/1925. [S677] Index - England High Court of Justice, England & Wales National Probate Calendar, administration (with will) registered in Sydney to the Permanent Trustee Co of NSW and sealed in Llandudno. [S492] Rookwood Cemetery database, at http://www.rookwoodindependent.com.au, Old Church of England, Section AAAA grave 2162; not found in Sep 2013 search. [S502] Index - Victoria BDMs online, at https://online.justice.vic.gov.au/bdm/indexsearch.doj, Marriage Reg. No. 20048/1941. [S488] Index - Queensland BDMs (online and fiche), at https://www.qld.gov.au/law/…, Death Reg. No. 1970/B20102. [S116] Census - 3 Apr 1881, UK Census, ED 13 RG11-1425 Folio 35 p29-30 FHL film 1341346. [S190] Index - GRO and Office of National Statistics, England & Wales Civil Registration Qtrly Indexes, Marriage: District of Dursley, Vol 11, p359. [S178] Census - 5 Apr 1891, UK census, ED 2 RG12-182 Folio 50 p43. [S190] Index - GRO and Office of National Statistics, England & Wales Civil Registration Qtrly Indexes, Death: District of Hackney, Vol 1b, p272. [S677] Index - England High Court of Justice, England & Wales National Probate Calendar, proved at the Principal Registry by Sarah Lavinia FORSAITH of 95 Clapton-Common Widow the Relict, Thomas GOODMAN of Royston in the County of Hertford grocer and James Samuel FEARNLEY of St Mary Cray in the County of Kent paper-maker the Executors. [S190] Index - GRO and Office of National Statistics, England & Wales Civil Registration Qtrly Indexes, Birth: District of Royston, Vol 6, p592, 1Q1848, mother's maiden name BENDALL with name as John Edward. [S190] Index - GRO and Office of National Statistics, England & Wales Civil Registration Qtrly Indexes, Birth: District of Royston, Vol 6, p610, 2Q1849, mother's maiden name BENDALL. [S190] Index - GRO and Office of National Statistics, England & Wales Civil Registration Qtrly Indexes, Birth: District of Royston, Vol 3a, p192, 1Q1853, mother's maiden name BENDALL. [S190] Index - GRO and Office of National Statistics, England & Wales Civil Registration Qtrly Indexes, Birth: District of Royston, Vol 3a, p189, 4Q1854, mother's maiden name BENDALL. [S190] Index - GRO and Office of National Statistics, England & Wales Civil Registration Qtrly Indexes, Birth: District of St George Hanover Square, Vol 1a, p226, 2Q1859, mother's maiden name BENDALL. [S190] Index - GRO and Office of National Statistics, England & Wales Civil Registration Qtrly Indexes, Birth: District of St George Hanover Square, Vol 1a, p263, 4Q1861, mother's maiden name BENDALL. [S190] Index - GRO and Office of National Statistics, England & Wales Civil Registration Qtrly Indexes, Death: District of Blean, Vol 2a, p1319, 4Q1916. [S365] CD - Sth Australian Births, Sth Aust Index of Births 1842-1906, Book 634, p300. 123. Samuel Forsaith of Braintree Born April 27th 1776 Baptized June 4th 1776. [S6] Newspaper - Times of London, edition of 21 Jan 1824, p.2, col.b; also payment of dividends advertised in 'Times' editions of 31 May 1824 and 8 Jul 1826. [S119] Family Bible - Thomas Spencer Forsaith bible, notes that the Rev Mannering spoke over the grave and preached a funeral sermon in relation to the deceased on Sunday 15 July from 1 Corinthians XV 55. On 21 May 1752, after the death of his father he was admitted to the Court Baron (aged 8) as the owner of the 6 cottages previously held by his father and he also appears at the Court Baron held on 9 May 1754, with his mother as guardian (LR 3/43). At the Court Baron held on 14 May 1767 it was reported that Samuel FORSAITH, jeweller, of Birmingham, on 21 Aug last surrendered two cottages, afterwards three, now six, formerly in the occupation of John PLUCKINGTON after of John LUCY, George JORDAN, and Mary NEWMAN, and now Mr DUFFELL, Mr TAYLOR, Mrs BELSFORD, Mrs PIERREMAN, Mrs BERKHILL and John PLUMMER, to John LANGSTAFFE (LR3/44/1). [S390] Book - S Forsaith, Samuel Forsaith Commonplace book, This gives the date as 8 Apr 1744 O.S. [S166] J W Forsaith, "Forsaith Family tree 1715-1942" ,This gives a differing date of 14th August. [S667] England & Wales Non-Conformist & Non-Parochial Registers 1567-1970, at http://www.ancestry.co.uk, England & Wales Non-Conformist Record Indexes (RG4-8) (note:; dates in these records tend to be several days after the event). 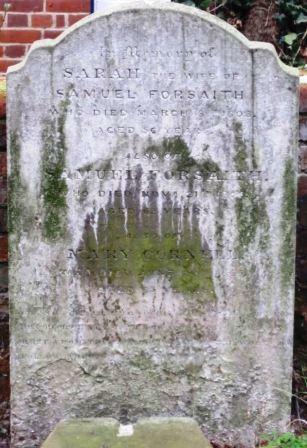 Samuel Forsaith of the Parish of Braintree in the County of Essex aged 62 years was buried in the Protestant Dissenters Burying-Ground in Bocking on the 29th day of Nov. 1806 by me Thomas Craig. [S166] J W Forsaith, "Forsaith Family tree 1715-1942" ,Married twice?